There are days I get out of bed feeling like I could conquer the world. It doesn’t take long for my mind and body to start wearing me down. The thoughts of you’re not good enough or strong enough or worthy enough sneak through the crack of the back door. My body then starts whispering you can’t do this, you will fail, why even try? I’ve learned so much about myself in yoga class. I’ve discovered that there are days I am a badass and others I cannot even come close to bending over and touching my toes. I’ve learned to be patient and to have a sense of humor when I realize the part of me that wants to achieve something is not always the part of me in control. I have learned to accept my limitations but at the same time not allow them to permanently hold me back. I’ve learned that some days I can and other days I can’t and at the end of the day not to beat myself up because tomorrow’s another day. Last week my yoga class practiced an arm balance. I got into position but then sat down on my mat. My back hurt and I couldn’t get my leg where it needed to be so I gave up before I started and didn’t even try. 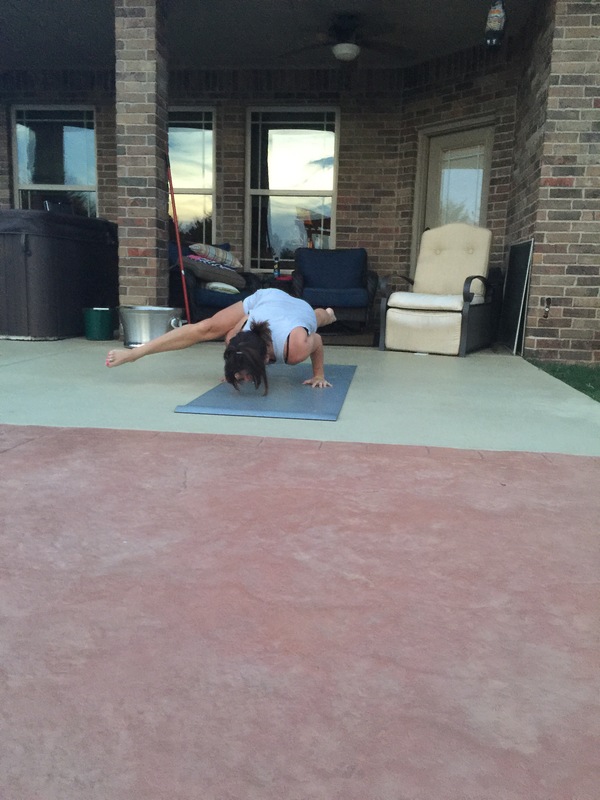 Last night I did some yoga outside and during my workout I found that amazing place in between my body and mind. That place where anything is possible and nothing is holding me back. Then it happened without thought or need for effort. That pose I couldn’t even attempt a few days earlier came easily to me as I smiled quietly to myself. That voice that says no you can’t was replaced with oh yes you can. That body that once felt weak and shaky was solid and strong. You can learn so much about yourself if you have the courage to keep trying without fear and judgement. It’s okay to rock today and crawl through tomorrow. There will be good days and bad days but it’s imperative to love and accept yourself through both. The world is your stage. You just have to have the courage to show up. Sometimes life feels a little boring and I have to stimulate myself a bit to prevent sleep walking through the days instead of living through them. That feeling of being totally alive is a feeling that I crave. I felt it at the Grand Canyon and as I caught a glimpse of Santorini for the first time. I felt it when my daughter swam her goal time at high school states last year. The everyday tasks take over sometimes and before I know it, I am smothering underneath the routine. This month I am challenging myself weekly to do something outside the norm to keep it interesting. Today I ironed. I know it sounds crazy but it is something that I rarely do except in cases of extreme emergency. Now when my daughter comes down looking like a million bucks instead of like a wrinkled mess, I will high five myself and carry on. What do you do to keep life interesting?